Here’s a link to some of my favorite kitchen items from amazon, essentials & favorites, in case you’re interested! This is my most current, 2nd kitchen in Seattle. More cabinet space than I’ve had in years! 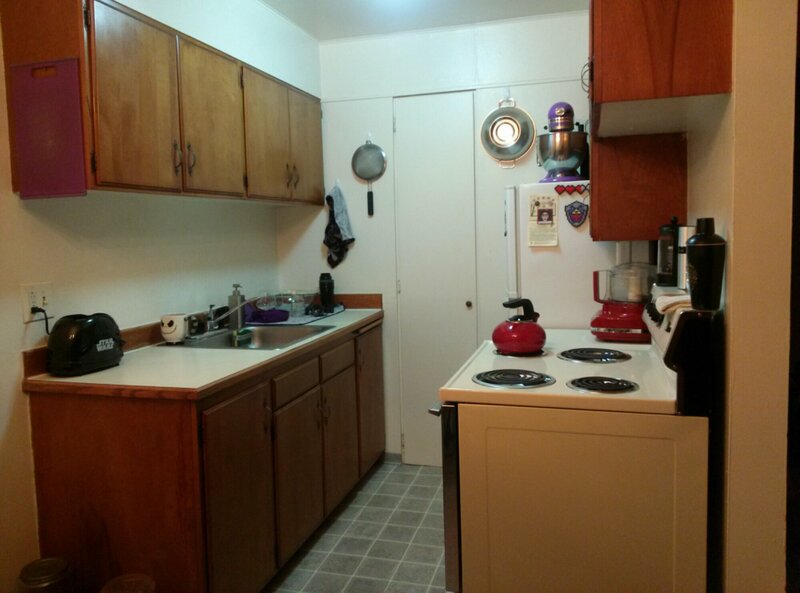 Which is great so I can make the most of the counter space. The only thing that’s weird is that the fridge isn’t full size. It’s quite narrow and small, but given that our fridge was nearly empty half the time in our last place in 1st Hill, I guess it’ll be fine! This place is similar to our last 2 apartments in that it’s a 1/1 somewhere on the lower end of the 500-650 sq ft, but we LOVE the location and it has a nice layout. We hope to just stay put here until we’re ready for a house. 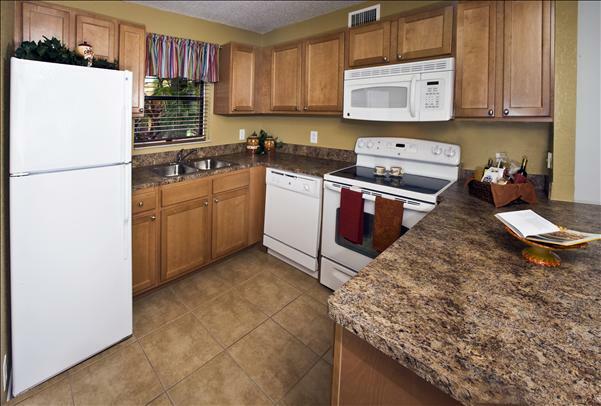 Here is the fancy model picture of the kitchen I cooked in for 2 years in South Florida, after moving back from NYC. 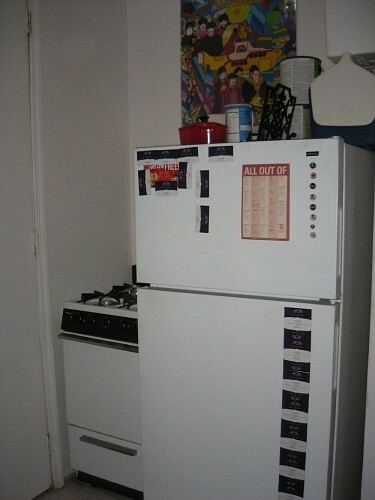 I pretty much lived in this kitchen. I even had a stool in there permanently to sit on / use to reach higher cabinet items. Most of our parties happened here or in our gloriously large patio. This place was enormous! 2/2 1300 sq ft! And here is where the blog was born in March of 2010. An itty bitty 222 sq ft studio in Brooklyn, NY. Congrats on the job. Where are you going to be working? i know, but at least this time, i’m thrilled. lots of room in the new place, same neighborhood so you & will will have to come over for dinner : ) i got my job back at boca, and even got my raise! Your kitchen actually looks a little larger than mine here in Japan. I agree with Elizabeth, I definitely cook more in a smaller kitchen. Perhaps it has something to do with the challenge. I have found my best friend in the kitchen is the rice cooker. It saves me every time. What is your saviour when it comes to cooking? hmm I like your cook book stand. If only I had space for one. i keep it on top of the fridge when not in use! i ❤ my toaster oven the most in any size kitchen. there's so much you can do with it, and not have to drag all the stuff out that you keep in the oven : ) mine has a convection setting too, so it speeds up baking. i've definitely been cooking more since we moved here, but i'm pretty sure that's because i'm currently unemployed, but maybe you're right. hah. Wow, reminds me of my kitchen in Fort Lauderdale! 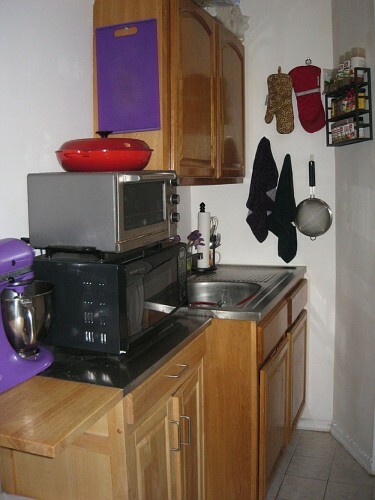 Our entire apartment is just 540 square feet, so you can imagine small the kitchen is. But I find myself cooking far more than I did in my last place, with a rather expansive kitchen and full kitchen table. I guess there’s something about small kitchens that brings out your creative spirit. believe me, i understand. i don’t know how many square feet this is, but the whole place is about the size of my bedroom in my apartment in boca. i’m gonna guess no bigger than 400? ok, i measured, the whole place is 222sq ft.